Okay.Having lived on The Algarve for fours years myself, where most of our friends were bar owners, I can totally relate to the issues faced by Joe and Joy in the Canary Islands.This is a MUST READ for anyone who's contemplating flying out to the Costa Brava, Malta, Cyprus, Tenerife or Portugal to buy a bar and become a millionaire. These Johnny-come-latelies, as we used to call them, haven't a clue what they letting themselves in for. They honestly believe all they have to do is sit at the end of the bar smoking fat cigars and - ka-ching! - watch the bank balance grow day by day.However, the book is written as if Joe has just finished a Creative Writing class, which is a little frustrating. It's often hard to remember who all the characters are, although they're exactly the same characters you'll find in any ex-pat community across the globe.I love the way Joe refers to the chief gangster on the island as JP, as if anyone wouldn't know who JP is - he might as well have called him Al Capone or Ronnie Kray! This book should come with a warning! It's one of those books you can't put down until you finish reading. I was sitting in a cafe when I first opened this book. Breakfast patrons came and left, the lunchtime crowd disappeared and late afternoon I ordered another coffee to justify occupying a table for most of the day!Joe's descriptions of moments in time and sense of place does what only great travel writing can do. Such observed writing gives us colours,flavours, imagery, customs - as if postcards arrive in our mailbox, sent by the Author, from a faraway place.There is a universal question the author asked himself. Am I really doing what I want in my life." And is he going to do anything about it? Well yes, he upends his entire comfort zone in preference of the unknown and intangible. Nothing short, I thought, of an act of social bravery. Many people dream of running a bar abroad. They sell up everything but often return broken from the experience. Changing everything and moving abroad to run a business is exactly what Joe does. Joe leaves his mind-numbing but comfortable job " of no binding allegiance" and commits to doing something that has no way out. Something that he and his partners have to see through whether they liked it or not. Joe took responsibility for his own future. I liked the universal theme of bravery, hope and optimism. You see human endeavor in action- how hard work, tenacity, drive, zest for new experiences, with a helping of luck- actually pays off. It's one huge learning curve of trial and error, of "meddling in the dark, learning by mistakes and bluffing when all else fails"; not deterred by thieving staff, squatting prostitutes, local bureaucracy, laws and language differences- which makes for an inspirational read. I absolutely LOVED this book! Reading it felt like I was peering through the window on the soap opera (and, more often than not, sitcom) that is Joe and Joy's life. Despite the trials and tribulations and all of the pitfalls that beset them, you still get an underlying sense - through Joe's clever, witty writing - that moving to Tenerife was the best thing he ever did. Fantastic book - would highly recommend it. Looking forward to the sequel. Joe Cawley doesn't pull any punches in this well-written account, funny and heart-breaking by turns, of the first six months of a new life for Joe and Joy: exchanging a fish stall in Bolton for running a bar in Tenerife. The list of characters will be familiar to anyone who has ever spent time in an ex-pat community and the description of driving conditions will ring bells with anyone who has ever experienced the white-knuckle ride of a southern European motorway. The fact that I was reading it while on holiday in Tenerife made it all the more real, even if the experiences described took place over 25 years ago. A good, easy read, recommended for anyone who likes travel writing, or especially for anyone interested in living and working abroad. Wow. This book really brought it home, just how hard it can be to achieve your dreams. Living in paradise is never as easy as it seems, and for some people – like Joe Cawley and his semi-dysfunctional family group – it is really, REALLY hard!I loved this book. It made me laugh, there were tense moments, nerve-wracking ones, and some that would have made me tear up if I was less of a man. Ahem. In fact this book really involved me in the lives of its characters, to such a degree that I found myself dreading their next shift in the bar for them, cheering their triumphs (without giving anything away), wanting to slap them on occasion and having the urge to give certain other characters a bloody good hiding!Yes, this book had it all. I strongly recommend it to anyone, especially those in need of a laugh. You don’t need to give a fig about Tenerife to enjoy this crazy rollercoaster of a story – but by the end of it, you’ll be glad you’re here reading about it and laughing, rather than being there with them…It’s a 5 star vote from me. If you've ever thought about ditching your blah, everyday job in a cold climate and starting all over on a sunny tropical island, read this book first! It's the story of Joe, his girlfriend, his brother, and his brother's wife, as they uproot from working in a damp fish market in England and restart life as bar owners in the Canary Islands. The four meet with their fair share of struggles, crises, adventures, and a parade of interesting characters. Cawley balances everything very well here. The language is descriptive without being distracting, and the content is humorous yet entirely believable as fact. It's real life, well-told. Though it is written from a distinctly British point of view, I didn't find any problem relating to it as the "bloody Yank" that I am. A recommended read for anyone! Joe and Joy abandon their jobs in Bolton Fish Market and buy The Smugglers Tavern in El Beril, Tenerife along with Joe´s brother David and his wife Faith. They quickly find out that running a bar/restaurant is physically and emotionally hard work 18 hour days, 7 days a week; especially when confronted with the relentless heat, red tape, a catalogue of disasters, infernal cockroaches and the Eternal Brit Abroad mentality of their customers. Joe Crawley his unique style of humour into even the most dire of disasters as he describes the maiden year of The Smuggler´s Tavern. A must for anyone who has moved abroad or is thinking about doing so. It is easy to read, highly amusing and scarily true. Enjoyable read - Witty, well written memoir - I am a sucker for the 'moving abroad' genre - this one didn't disappoint. First, let me tell you that More Ketchup than Salsa has no recipes for either ~ I was in search for something new to make for dinner the day I downloaded this book. Now that I have read it, it is a very funny story written with dry British humor.The variety of characters that visited the bar as Joe, Joy, David and Faith until she gave it all up was quite funny. They adjusted to the responsibilities of owning and operating a bar in a resort area with ever changing customers. It is written from Joe's point of view and his insights into the crazies of operating a bar/restaurant when none of them knew what they were doing. It was a sink or swim situation and with determination, learning on the job and keeping a positive attitude they made the first six months, the mile stone test for success. Living on an island in the tropics compared to the no future job selling fish in Bolton's Fish Market was worth all the stress and putting up with the conglomerate of the population the frequented the bar know as Smuggler's Tavern. It was written with very funny dry British humor, often sarcastic, which is my favorite kind of humor; I enjoyed reading this account of owning a business in paradise, cockroaches an all. I would defy anyone who has ever lived in the UK, or anywhere else that is often cold, wet and rainy, not to say that they have had a secret yearning to change their life by heading for a life abroad. Every years, millions of us make the cattle class journey to European resorts and we watch the Brit’s who have made it, those who live permanently in our holiday destinations, with envy, thinking ‘what if‘. But, is the grass always greener in the sun? Of course not, it’s usually non-existent, the landscape can be barren and you definitely don’t get the manicured countryside that I love about Britain.In More Ketchup than Salsa, Joe had me laughing so hard that I spilled a cup of tea all over the bed. His tale of travelling from Bolton Fish Market to Tenerife Costa del Bognor opens up the can of worms that most of us never even consider when we are sitting sipping coffee on a terrace and dreaming. His daily battles with cockroaches, the local mafia, animals and the never ending variety of people that stepped through his door, was the wake up call I needed to think again about what it was I might just do if I ever decided to take the plunge and live abroad. This is the perfect book to take on holiday with you especially if you are already planning to make that move. If you ever dreamed about owning a bar on a gorgeous island this book will probably bring you back to reality. Cawley gets real about being a business owner on a popular vacation spot for the Brits. On Tenerife life seems great unless you have to work 14 hour days. It isn't until he and his girlfriend Joy have been on the island six months that they even go to the beach.This book started out really strong. Cawley humorously recounted their transition from fish market workers to bar owners. Unfortunately, about 2/3 of the way through the book I started to get bored. He seemed to be dragging it out unnecessarily. I wanted to know more of the gritty details like the effect of the bar on his relationship with Joy, if it was profitable, etc. He focused more on cockroaches (GROSS) and the customers.It's a fun summer read if only because Cawley does a great job describing the island. The book is the epitome of a non-fiction beach read.I doubt I will read his sequel probably due out this year. I just didn't love this book at the end as much as I did at the beginning and in the middle. If your looking for a light hearted read to get you in the mood for your summer holiday this year then this could well be exactly what your looking for. Anyone who has ever been to a spanish holiday resort will relate to almost very page of this rib tickling tale, even as tourists and not bar owners, the way joe tells his story brings you in buys you a beer and welcomes you to the sun. Personally i have lived in various resorts in spain and experienced the highs and lows of working in the spanish sun and although some people will read bits of this book and say "nah that never happened" believe me knowing the expat communities over there- it'll all be true and there's probably a lot more tales to tell.Joe has knack of endearing you to his characters, so you don't just read about Joy, Frank, David and the others you laugh with them cry with them and feel their frustration at times with less than congenial customers. Don't be fooled into thinking this is just another story of brits abroad, it's a book of fears, laughter, blood sweat and tears not to mention a cold beer or two. Put up the parasol grab your flip flops and enjoy! A really enjoyable and entertaining read. Joe and Joy his brother David and his wife Faith swap the grey skies of Bolton to run a bar in El Beril, Tenerife. If anyone ever thinks it must be marvellous to run a bar on a sunshine holiday island – think again! They quickly find that it is fraught with difficulties not the least being the Spanish Banks and other authorities. Joe has a marvellous eye for detail and his descriptions of the expat community and British holiday makers is brutally accurate! I’m thankful never to have said to any Bar owner ‘it must be great to work and live here’ ! However depite everything they make a success of running the Smugglers Tavern. I enjoyed it so much I had to download the next instalment of More Ketchup. Confessions of a Tenerife BarmanWhen Joe and girlfriend Joy decide to swap their lives living in Bolton and working at the local market on a seafood stall, for a life of sunshine and sand running a British themed pub restaurant in Tenerife, they soon find out that living and working in a busy holiday resort and amongst ex-pats is full of mishaps and their dreams become a reality and reality bites.This is a really funny and entertaining book. Joe gives an honest and humorous account shared in anecdotes that are extremely well written and you can not help laughing at the situations the couple find themselves in and at the same time really hoping that all works out well for them in the end. This was the most entertaining book I've read in years. Having come from British stock & having lived for a season as a Canadian expat in the UK , I resonated with the adventures of the Cawleys. We may speak the same language but the interpretation varies wildly. I can't wait to download the next adventure. Joe has given me permission to resurrect my understated wit & humour . I'll be using it in my writing. Let's have a virtual cuppa soon! Enjoyable read. Joe's a good storyteller. I pulled up a high stool at the bar and engrossed myself in the surrounding and characters of this Bar in Spain. Any thoughts of running my own bar in sunny lands has flown out the window. But it was great to live vicariously by Joe for a couple of months. A laugh on every page!I thoroughly enjoyed every chapter! Even though I have never been to the Canary Islands I could "see" the bar and all the "locals". That to me is the sign of a good book. I read for my satisfaction. A FIVE STAR must eat.I hope that the rest of the series is s good. If you ever thought that owning and running a bar at a holiday resort would be easy - read this and disabuse yourself of those thoughts. A fun, light book about the trials and tribulations of being a bar/restaurant owner. Tenerife, tantrums and toil! Okay, I'm not going to lie...I'm still not sure if this book was a work of fiction, or the author's re-telling of his personal story. BUT...I don't really care. I really enjoyed reading it, and I could hardly put it down. It was well written, captivating, entertaining and funny. I could not put this down. From the freezing town of Bolton, where my family are from and I lived for a while, to sunny Tenerife and the people visiting The Smugglers every mad character that Joe and Joy met had me chuckling to myself. I can vouch that Bolton if cold and miserabe!! A very funny & fast read! Anyone who's ever lived or worked abroad will be able to relate. I really found myself rooting for the main characters throughout, and gave a silent cheer every time they overcame a new obstacle. Hopefully, there's a sequel in the works, as this is fertile material indeed! 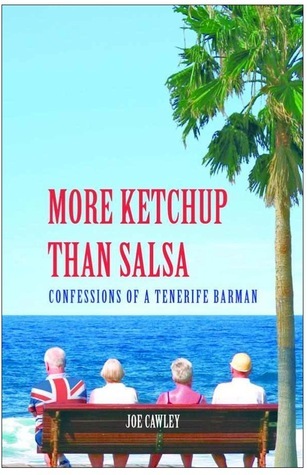 amusing and engagingLots of funny moments in this memoir relating the move from cold Britain to tropical Tenerife. Well written, amusing and uplifting. If you like Bill Bryson, you'll enjoy this. Worth the read! Worst book I have ever read. The story was all over the place. It must be hard to write good humor. I would not recommend this book. Good thing it was a free book, I would have requested a refund. Hmmm I never gave a book one star. Pretty darned good.Twenty-something's pack up and move to the Canary Islands and buy a tourist bar. Found myself rooting for people I don't know in a place I'll never visit in a business that holds no interest for me. Go figure. And go Joe & Joy! Interesting ebook on life for expats from England, moving to Tenerife and buying a bar and running it. Not knowing the language, having no experience in running a bar or restaurant, dealing with people from several countries speaking different languages. Easy read. Thoroughly enjoyed it - interesting characters and funny, downside I keep checking for creepy crawlies. Joe Cawley - Joe Cawley is a travel writer and award-winning author published in many international newspapers and magazines such as The Times, New York Post and Taipei Times.His first book, More Ketchup than Salsa was voted 'Best Travel Narrative' by the British Guild of Travel Writers and follows the disasters of a young couple seeking greener pastures abroad.Joe currently lives in the hills of Tenerife with his family and an assortment of other wildlife. Although he loves his family dearly, he admits he gets most sense out of the guinea pigs.